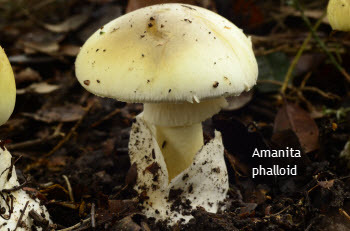 Amanita phalloides, known as "death cap" or "death angel" and Amanita ocreata, known as "destroying angel", are the species most commonly identified in most toxicity cases. 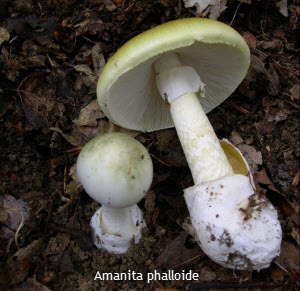 The phalloides variety can be found throughout North America and grows most commonly under oak, birch, pine and other hardwood trees. It can also be found in open pastures. 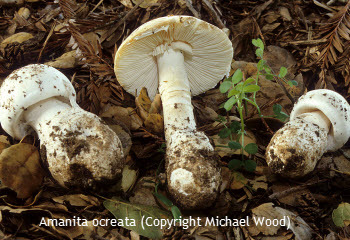 The ocreata variety is more common to Western North America. Unfortunately, every summer we see a dog that has eaten Amanitin mushrooms. The mushrooms cause acute liver failure. Dogs will start vomiting and potentially have diarrhea within 6 to 24 hours of ingestion. Abdominal pain may also be noted. Anorexia, lethargy and yellow discoloration of eyes and gums will also occur. Dogs may start drinkng and urinating excessively, and bruising may be noted. Seizures can develop. These signs are suggestive of liver failure, which will develop within 36 to 48 hours. Induced vomiting and very aggressive care including charcoal administration every 4 to 6 hours for 2 to 3 days post ingestion, IV fluid therapy and the use of various medications to help support the liver are a necessity. Serial blood tests will need to be performed to assess liver function, blood glucose values and clotting profiles. Even with very aggressive care the prognosis can be guarded. 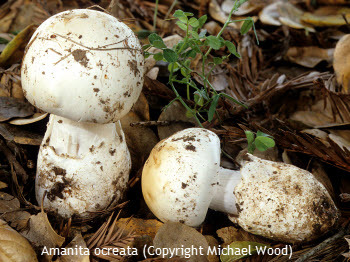 Please note Amanitin mushrooms are also very toxic to people - with a mortality rate of 20 to 40%.